Awesome!!! Thank you Joachim, looking forward to the screenshots. Hope you don't mind a small video about the D-AQUI alehead mentioned. Wow, took 22 posts and almost 3 and a half hours this time. I think that is the longest time to guess in a while. Finally! A great idea, I think! And please add a 'rockin' soundfile! I always thought that the new Twotter will be the last aircraft I'll get. Now I have to add another one. Otto, you should know better there will always be a new last aircraft to buy. Whos going to be the first to fly her round the world in FSX? Ohhh no, depending on other work it might be impossible for Joachim to complete this in 2013, but if so 2014 is certain. Excellent! Chalk me down for one purchase. One of the last flying Ju-52s (D-AQUI) flies over my house every so often. The sound of these beautiful radial engines always announces its proximity in its unmistakable fashion. Here are two photos that I took a couple of months ago (unfortunately the visibility wasn't the best). I also made a video of one flyby that I can upload, if you guys are interested. 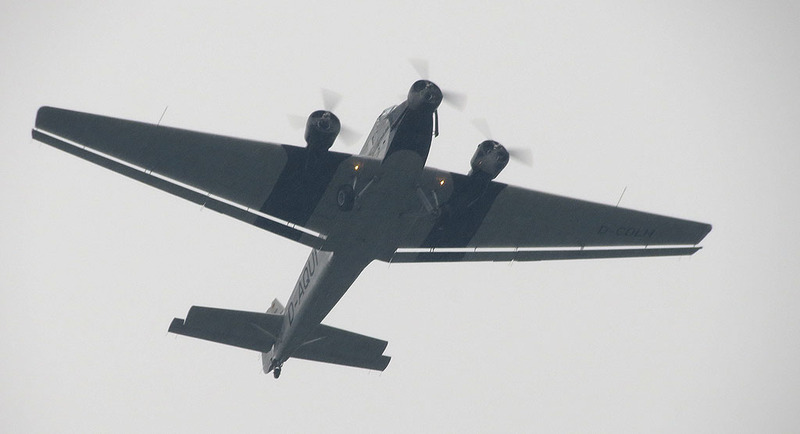 One of the last flying Ju-52s (D-AQUI) flies over my house every so often. The sound of these beautiful radial engines always announces its proximity in their unmistakable fashion. Please do upload, I actually never saw one fly in real life. Mathijs you should get yourself over to Flying Legends at Duxford, she is there every year. The D-AQUI is flying from Oberschleissheim quite regularly. Why don' t you (aeroSoft) plan your next 'Konferenz' in Oberschleissheim according to the schedule of the D-AQUI. Would be a nice gimmick I think. Here is the video. Unfortunately the window got in the way and I had troube reacquiring her, but it's still nice to see, I think. There used to be one based in Gary, Indiana. It used fly over my house all the time. It was hard for me to believe an airplane could fly that slow and not fall out of the sky. It was very cool to see, but Gary Airport kicked the Commemorative Air Force out quite a while ago. They also had a C-47 there as well. And I thought, you were flying next to her. This is, what I still want to do some day to take photos. It was hard for me to believe an airplane could fly that slow and not fall out of the sky. Yep, although she's not the fastest old lady, she is not as slow as it seems. Due to her large wings and so on it loos pretty slow even when she flies 100kts ore more. Hope you'll see one in real life someday, Mathijs. I thought there was one at the Paderborn FS Conference 2 or 3 years ago? You may well have been too busy to go outside and see it though. I seem to remember that visitors were able to book a seat for a short flight................or maybe I just have strange dreams! Hey, is this going to include the 3-bladed version as well?